It’s Not A Debt Increase… | The Rockin' Conservative! The current description of the negotiations regarding increasing the debt limit is a fallacy. We are not negotiating to increase the debt limit, we are negotiating to increase taxes. We may or may not increase the tax rates on some or all individuals or corporations, but raising the debt limit is still a tax increase. Republicans, Libertarians, Conservatives and Tea Partiers better start calling this what it is: A TAX INCREASE! Let’s say the government takes $10.00 in taxes and spent all that money, but they also borrowed and spent another $1.00 for a total of $11.00. To pay off the government, citizens will pay taxes. Is the $11.00 repayment going to require more taxes? Or less taxes? Is the extra $1.00 that the taxpayers will now have to redeem to the government a tax increase? Or a tax decrease? If we give them another $100 on that debt limit, what do you think they’re going to do? They’re going to spend it! It will be another $100 added to the $5,800 that we already owe. The Federal Government is currently authorized, based on tax rates, to collect about $2.1 Trillion per year. In 2009 and 2010, the Obama Administration spent $3.4 Trillion and $3.5 Trillion per year. So, in 2011, taxpayers must now pay the $2.1 Trillion authorized PLUS the additional $2.7 Trillion from the 2009 and 2010 PLUS whatever deficit spending occurs in 2011. More Taxes; More Deficit; More Taxes; More Deficit; More Taxes. This is not a debt ceiling increase; we better start calling it what it is: A TAX INCREASE! What you say is true but the effect on the “adults” who pay taxes is that the tax bill doesn’t come due until some time down the road. It’s like charging something on your credit card. You won’t feel the actual pain until your MasterCard bill comes in the middle of next month. Your choice then is to either take your medicine (or peas if you’re BHO) and pay the entire balance or pay the minimum amount. You can also pay something in between those extremes. Those who pay the minimum amount never pay off their credit cards. Their credit card bill becomes like a 30 year mortgage. Eventually they are forced to pay it off by circumstance or they declare bankruptcy. As a nation, we’ve spent nearly a century paying the minimum amount. The amazing thing is that we keep raising our credit limit (debt ceiling). What would happen to a consumer’s total debt if that individual could raise his own credit limit at will. For many people the result would be out of control debt and financial catastrophe. That is unfortunately where our nation may be headed. So your answer is for the US to declare bankruptcy? Big problem with that chart — how about not squandering a surplus, not borrowing out the wazoo to start 2 wars while simultaneously cutting taxes? Those bills are due NOW. Obama didn’t run up the deficit except to try to stem the bleeding — the deficit was sent spiraling when the economy crashed (because of many things, but any surplus was long gone through the wars and tax breaks) and the revenues dropped like a rock. We need to reform taxes, cut spending in a measured way so the economy can still survive and hopefully grow, even if slowly. We cannot have the reasonable debate needed for doing these difficult tasks while our personal wealth (think about your 401K) is being held hostage in a manufactured debt ceiling crisis. 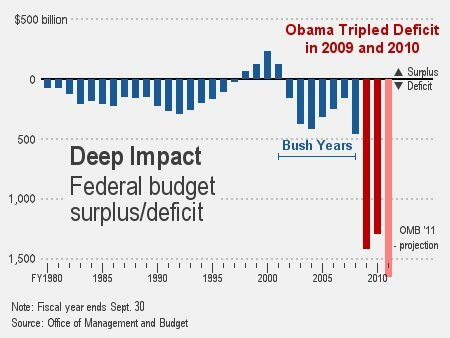 you realize that first year of obama’s presidency, when the deficit shot up like that, we were still under Bush’s last budget? As a percentage of GDP (which is how the deficit should be measured), we’re actually in ok shape at the moment. The concern though going forward is that the deficit will start to rise again, due to more baby boomers entering into medicare. So if you care about the debt, that’s where the politicans need start offering some solutions for cost savings.